Attach a stirrup (handle) to a chest-high cable pulley. Stand with your side to the pulley. Grasp the stirrup with the hand nearest the pulley, pull the stirrup to your chest, and place your free hand over the hand holding the stirrup. Extend your hands out in front of you until your elbows are locked. Hold this position for a count of five without allowing your body to rotate. Bring your hands back to your chest. The cable horizontal Pallof press is a very effective functional exercise to use to strengthen your core’s ability to resist rotational or twisting forces. The end result is a stronger, more stable core, which will benefit all other areas of your training and athleticism. Keep your shoulders and hips facing forward at all times. If you can’t, you are using too much weight. 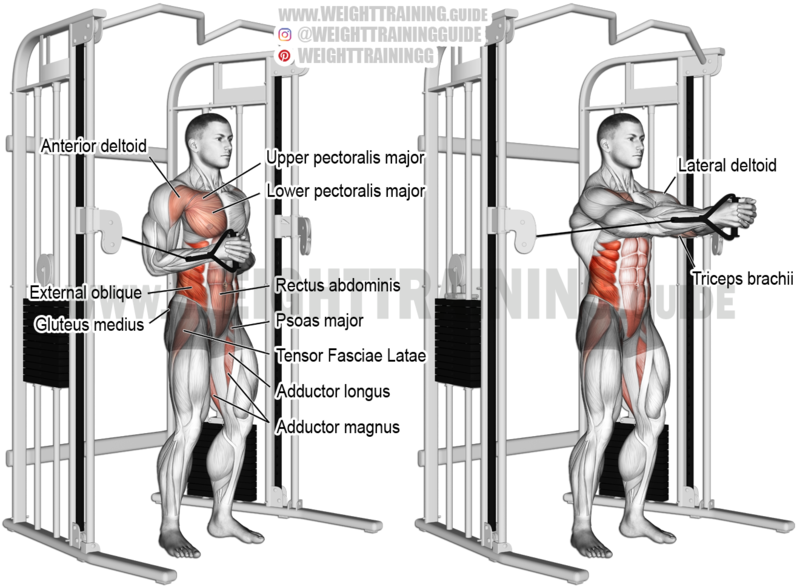 All muscles are trained isometrically. See also the cable vertical Pallof press. That’s why I like this site … not only exercises for building muscle but also for improving function. Keep it up! Thanks for this. Really appreciate it.